New Year’s Eve is special in every city, but in Vienna, the end of the year is a musical affair. From world famous orchestras to waltz parties, elegant dance balls to crowded and joyful beer houses, every one celebrates New Year’s Eve in Vienna with a song in their heart and a dance in their step. In Vienna, New Year’s Eve is called SIlvesterpfad, or the New Year’s Path. Everywhere in the heart of the city, streets are crammed with revellers who stroll along, eating at the outdoor food stands, and watching live performances throughout the city. Right in front of the Rathaus, or city hall, you can find people waltzing all afternoon. You can even find waltz lessons, if you need to learn the steps. The dancing there goes place all night long. There are also open air waltzes all night on Der Graben; one of Vienna’s most popular streets. Waltzes and minuets are not the only kinds of music on New Year’s Eve in Vienna. Public squares all across the city host live concerts with musical acts that range from rock n’ roll to samba music. Other streets, pubs and dance clubs feature DJs playing the hits from every decade, including today. 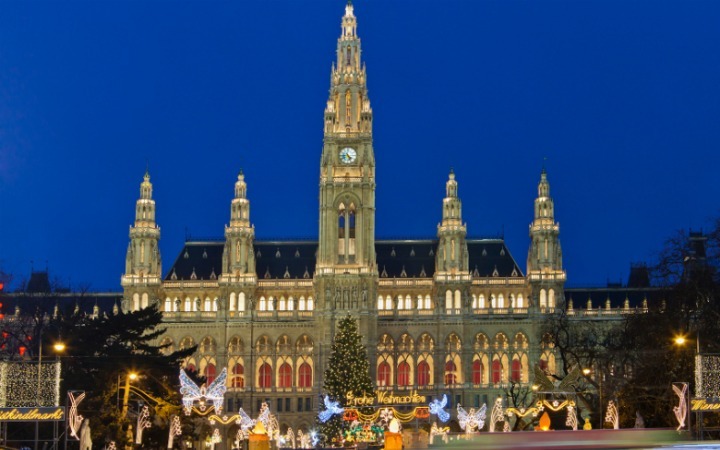 There are also a number of elaborate and elegant parties in Vienna on New Year’s Eve. It is the start of Vienna’s famed Ball Season, and the world famous Kaiser Ball in the glittering halls of the Hofburg Palace is the cornerstone event. The medieval Hofburg was once the home of the Hapsburgs, who threw many stunning celebrations here. The Kaiserball has been held every New Year’s Eve since 1970. More than 2,000 guests come from all over to celebrate both the New Year, and Vienna’s largest and most extravagant ball. If you’re not dancing the night away at the ball, at midnight, you will head over to St. Stephen’s Cathedral, to hear the largest bell in all of Austria welcome in the New Year. The cathedral is the symbol of the city itself, and has been a central part of the country’s history. The bell’s name is Pummerin, and it is only sounded a few times a year to mark special occasions. Midnight is also time for the city’s incredible fireworks display. The exploding lights fill the night sky all over the historic core of Vienna, delighting the millions of party-goers on the streets below. Festivities officially continue until about 2 a.m., but will often go far later into the night, and into the next morning. Don’t have too much to drink, because you want to be awake and alert for Neujahrskonzert; an annual concert by the Viennese Philharmonic Orchestra which is broadcast all around the world. It has been a New Year’s Day tradition in Austria since 1939, performing waltzes by the Strauss family at the Muskiverein Concert Hall. You may into the concert itself, if you didn’t order tickets more than a year in advance, but you can certainly watch on television in a hotel, restaurant or bar, along with the rest of Austria and 50 million people around the world.